Nimble is a well-known and one of the best CRM tool for small business that primarily provides cloud-based business solutions. The decent tool is specifically made for small and medium business convenience. You can see Top 10 CRM Tools for Small and Medium Businesses and Top 3 CRM Tools for Small and Medium Businesses to look into details. 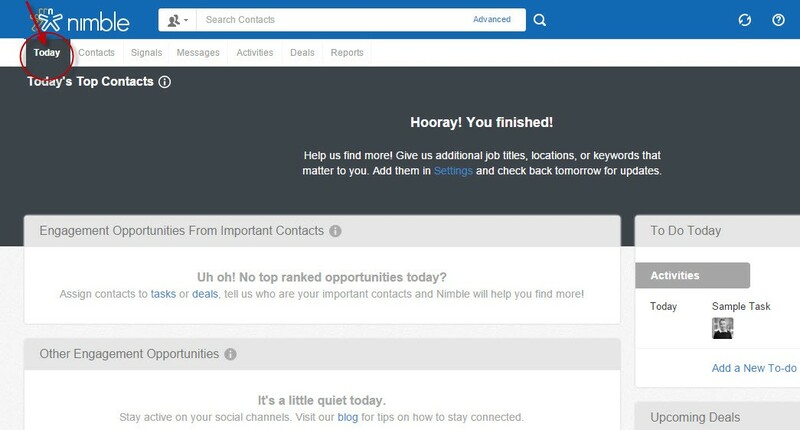 If you want to manage contacts, build a relationship with them and convert them as customers, Nimble is made for you. The tool helps you to do such tasks for contact management and generating leads. The tool is highly organized and you would love the way it is incorporated with social media. The tool has a huge list of known companies in which it is featured. The best thing about the tool is that it offers one plan for all that does not confuse you to make choices. The free trial is limited to 14 days while business plan costs $15/MO/user which is comprised of all the features. The pricing is pretty affordable for small and medium sized business. 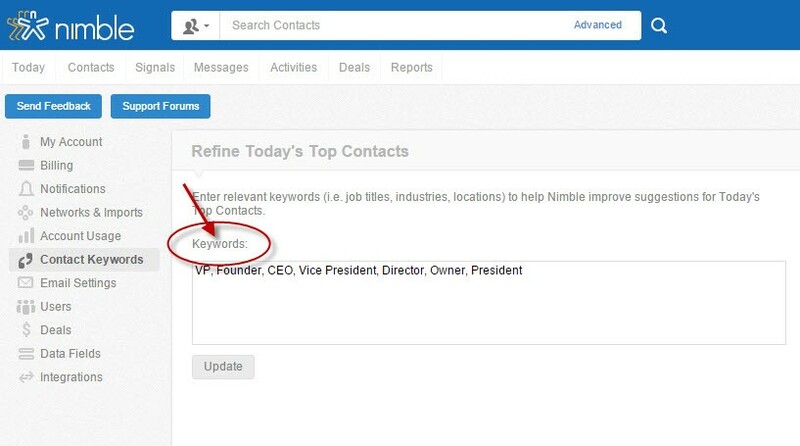 Right from the sign-up, Nimble keeps track of your contacts. 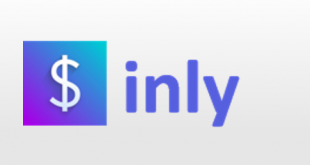 The tool automatically imports contacts from social media sites and other integrated apps. The tool is very powerful at contact management and very helpful when it comes to lead management. It keeps contact history and status as well to make it better social CRM. The tool lets you assign tasks to contacts, keep track of opportunity for a deal and manage upcoming deals all in one page. Also, you can add To-Dos in the activity section. The One page management is a masterstroke to other CRM tools. The great feature enables you to combine all sorts of inboxes in one unified inbox of the tool. Whether it is Gmail, outlook, and twitter or Facebook and LinkedIn. 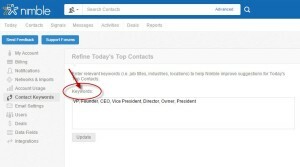 You can use your contact network in one place to make leads or to assign tasks. The tool has a very interactive deal tracker that you will like the most. On the deal page, you can begin with a new deal, make decisions, analyze it, get quotes, negotiate and end with the close deal. 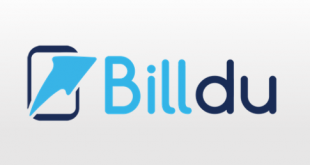 The tool is very simple to operate and manage your deals. The tool is very thorough at monitoring sales pipeline and reports. It allows you to see complete analysis reports like a deal is won, stuck, active or lost and the total. Awesome! The tool also gives brief reports about deal history and forecast deals. To find one contact in all contacts list is such a chaos. The tool makes it easier by keyword search facility. You are allowed to search and find them using relevant keywords (i.e. Job titles, industries, locations). Although Nimble is a web-based tool, but it supports many devices. The tool is available on both iOS and android store. A CRM in your palm, how does it sound like? Amazing! 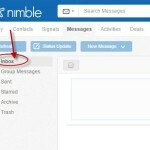 Nimble has robust integration with social media sites and google apps. 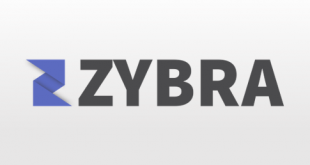 The tool is integrated with many third party apps like Google, Facebook,Twitter, LinkedIn, FreshBooks, MailChimp, Evernote, Zapier, Dropbox etc. 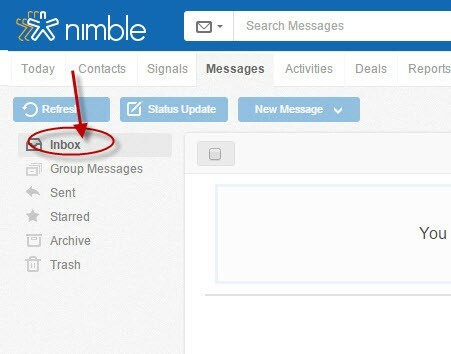 Nimble provides support via Email and video tutorials. You can ask queries in the community as well on the web. The good thing about the tool is that it categorize your queries and browse by topic. Commendable support! You can set up a semi-automatic campaign along with the group messaging. Impressive! Rules engine is stand out feature of the tool that gives updates and suggestions for better business. You never miss a thing on ‘signals’ tab of the tool. Stay updated. Group messaging is limited to 30 messages per user per day that seems less when it comes to run a campaign. The user interface looks like a Facebook page that is easy but not unique. As a small or medium sized business owner, you must have a large network of contacts at social networking sites, and if you don’t want to put large efforts in managing them all, Nimble will do it for you with its extensive features. The way it imports all the information about the contact and keep them in one familiar place is awesome. You can generate leads, stay in touch and tag them as well. 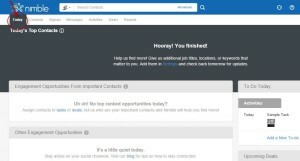 The tool appears to be a powerful social CRM for your business productivity. Other features like calendar, event management and reminders are also very helpful. Solid integration with many apps is good for usability of the tool. For more details, please visit: Nimble website. You can refer the detailed CRM tools product reviews for Zoho and Insightly for a quick comparison.